Arena’s Prayer feature is a powerful way to assist your members in their personal prayer life and for your prayer team to access prayers remotely. An Arena-managed on-line Prayer Request ministry system consists of three primary parts as well as a few optional components. This feature requires six pages. 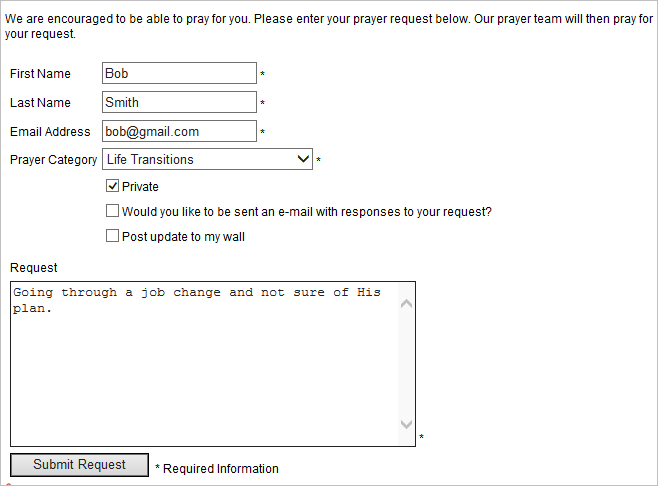 Customize the Prayer Request | Comments, Prayer Request | Expire No Renewal, and Prayer Request | with Renewal System Emails. Customize the Prayer Category, Prayer Source Lookups. Customize the Prayer Request Days Active and Prayer Request Renewals Organization Settings. •Prayer Request page – This page is a simple form for members and visitors to submit prayer requests. We recommend adding this page in a non-secured area (for the use of visitors as well as members). This page requires the Prayer Request module, setting a default Content Category (typically “Arena”), a default Source, (typically “Web site”), an optional default Prayer Category, (typically “General”), and an email address or addresses of who to notify when a prayer is entered or modified. •Prayer Session page – This page allows your prayer ministry team to select one or more categories of prayer requests and then view each active and approved request within the selected categories, with the option to add a comment. This page requires the Prayer Session module, where you can select which prayer categories to display, whether to display private prayers and counts. •Prayer Lists page – This page is a list of active prayers. It can be set to include only active, approved requests or any status. These lists can help your members to remember particular prayer needs by showing current requests, or they can act as a testimony by showing answered prayers. Your Prayer Lists may include sensitive or private information so it is advisable to place it inside a secured area of your website such as a centralized Members section. This page requires the Prayer List module, setting the Content Category, Source, and Status. •Prayer Calendar – This is an optional page to allow your prayer ministry to schedule a specific prayer-related event in a separate area of your website from your organization’s other ministry events. This is essentially identical to a normal Event Calendar, but it specifically displays events or promotions from the Prayer Topic Area. This page requires the Event Calendar module, with the Detail page set to the Event Details page associated with your primary Event Calendar, and the Topic Areas set to the Prayer Topic Area ID (789 by default) and any other Topic Area IDs you wish to display on this calendar. Once customization is complete, prayer requests can be entered from the staff portal or members can enter prayers from the Arena-managed external portal.